We have been trained to pay for everything with debt. We pay for our homes with debt, and mortgage debt as a percentage of GDP has more than tripled since 1955. We pay for our cars with debt, and at this point about 70 percent of all auto purchases in the United States involve an auto loan. We pay for higher education with debt, and the total amount of student loan debt in America recently surpassed the one trillion dollar mark. Wherever we go we pay with plastic. If you want a heated cat bed and a cute little cat sweater for your little kitty just put it on your Visa or Mastercard. Amazingly, consumer debt in America has risen by a whopping 1700% since 1971, and if you can believe it, 46% of all Americans carry a credit card balance from month to month. We are absolutely addicted to debt and we do not know how to stop. Running up debt at a much faster rate than our GDP is rising is a recipe for national financial suicide. Our politicians continue to steal about 150 million dollars an hour from future generations and everybody just acts like this is perfectly normal. We are going down the same path that Greece, Portugal, Italy, Ireland and Spain have gone. In fact, we already have more government debt per capita than all of those nations do. Both political parties have been doing this to us, and it just keeps getting worse and worse. Incredibly, the national debt has grown more under Obama in less than 4 years than it did under George W. Bush during his entire 8 year term. Since Barack Obama entered the White House, we have accumulated more than five trillion dollars of additional debt. We are on the road to national financial oblivion, and most Americans don't seem to care. In fact, if current trends continue we will hit 400% of GDP before too long. As you can see from the chart, there was a little "hiccup" during the last recession, but now the debt bubble is growing again. 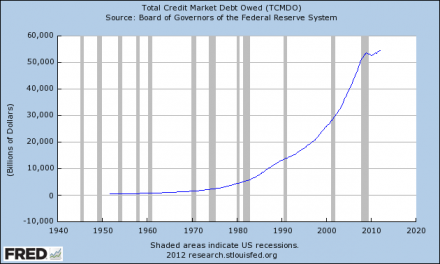 Total credit market debt owed is roughly 10 times larger than it was about 30 years ago. 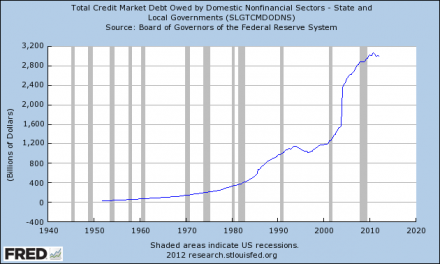 How in the world did we accumulate 10 times more debt in just 30 years? 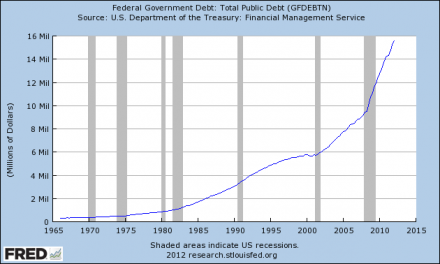 If we do that again in the next 30 years, our total debt will be more than 500 trillion dollars in the 2040s. Unfortunately, that is the way that debt spirals work. They either have to keep expanding or they collapse. So will the U.S. debt spiral continue to expand? Or will we soon see a collapse? Sadly, this exact same thing is happening all over the world. The government debt to GDP ratio in Japan (the third largest economy in the world) blew past the 200% mark quite a while ago, and almost every country in the EU is absolutely drowning in debt. The world has never faced anything quite like this. 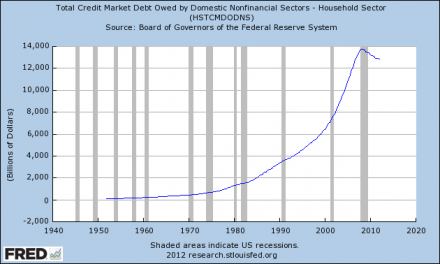 There is way, way too much debt in the world, but the only way we can continue to enjoy this level of prosperity under the current system is to pile up a lot more debt. The western world is like a debt addict in a deep state of denial. Some debt addicts end up with dozens of credit card accounts. They will keep opening more accounts as long as someone will let them. Most debt addicts actually believe that they will be able to get out of the hole at some point, but most never do. Most Americans still believe that we are experiencing "temporary" economic problems that will eventually go away. Most Americans still believe that even greater prosperity is still ahead. Sadly, what the mainstream media and the two major political parties are telling them is a bunch of lies. 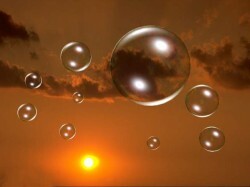 We have enjoyed the greatest prosperity that we will ever see in the United States, and when the debt bubble bursts there is going to be an immense amount of pain. That is a very painful truth, but it is better to come to grips with it now than be blindsided by it later.